Lobsters at the Maine Lobster Festival in August 2011. HALLOWELL, Maine — Maine lobster fishermen last year caught more than 100 million pounds of lobster for the first time, indicating the state’s signature seafood is robust as other fishery resources continue to flounder, the state’s top fisheries official said Tuesday. But even with a whopper of a harvest, Maine lobstermen continue to struggle with lower prices that began with the global economic meltdown in 2008, Department of Marine Resources Commissioner Patrick Keliher told The Associated Press. “Based on the sheer number of juvenile lobsters we’re seeing on the bottom, whether we’ll continue at 100 million it’s hard to say, but I think we’ll continue to show strong landings for the next several years,” he said. While the numbers are preliminary, 100 million pounds is impressive even in a state where lobster is king. The previous record harvest of 94.7 million pounds, worth more than $313 million, was set in 2010. David Cousens, a South Thomaston lobsterman and the longtime president of the Maine Lobstermen’s Association, remembers when the annual catch of Maine lobsters was around 20 million pounds in the 1980s. He never imagined the day when the catch would top 100 million pounds. While the lobster catch has fallen in southern New England in recent years, it has gone the other direction in Maine — topping 80 million pounds for the first time in 2009 and 90 million pounds last year. The catch has been particularly strong in the waters off the eastern half of Maine’s long ragged coast and is holding its own in the waters in the western half of the state, said Carl Wilson, a lobster biologist with the Department of Marine Resources. Lobster also has become more important to Maine’s overall fishing industry in recent years as groundfish, scallops, urchins and other fishing sectors have fallen off. 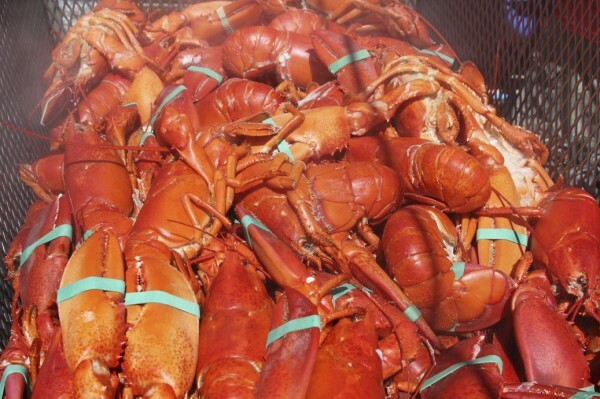 Lobster now accounts for about 70 percent of the value of the state’s total seafood harvest. Although the lobster harvest was strong last year, lobstermen have been hurt by low prices they’ve been getting for their catch. The official numbers for the volume and value of the 2011 lobster harvest weren’t available Tuesday and are expected to be released by the end of February. While struggling with low prices for their catch, lobstermen are dealing with high prices for diesel fuel, bait, rope and other equipment, Cousens said. “Our expenses are through the roof, and the price of lobster is $1.50 a pound cheaper than it was in 2006,” he said. The lobster resource has benefited from conservation measures, warmer waters off Maine and a decline in predators, such as codfish, Cousens said. But if the catch falls sharply in the years ahead, it’ll devastate the industry. Lobster is often viewed as a luxury food that’s bought for celebrations, said Matt McAleney of New Meadows Lobster, a lobster dealer in Portland. With the sour global economy, demand has been sluggish the past few years, he said. “Lobstermen need all they can catch to make a living, and I think that’s unfortunate,” he said.